How long can you plank? For the uninitiated, a plank is where you place yourself parallel to the ground supported by your forearms and feet. Easy? Perhaps for some. Guidelines suggest a healthy individual should be able to hold the plank for one minute - which is standard and considered an acceptable time for a plank. However, walking into the gym this morning to see a massive 50-minute plank on the Leader board was not only impressive but made me feel like I should up my game a little! 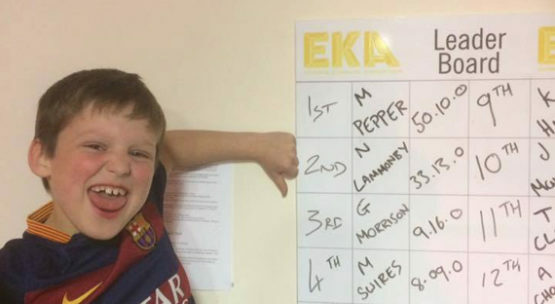 Even more impressive (and potentially disheartening) is the fact that it was done by a 7-year old by the name of Max (pictured above) who is a member of our club. This was done as part of our monthly challenges at Elemental Fitness. Let me say that other members of the club are happy and amazed by this little lad, and hopefully, he can continue smashing those challenges out of the park in the future. Well done Max!